All muffins, more or less, are made up of the basic proportion of ingredients. This means that the kinds of muffins you can make are limited only by your imagination. 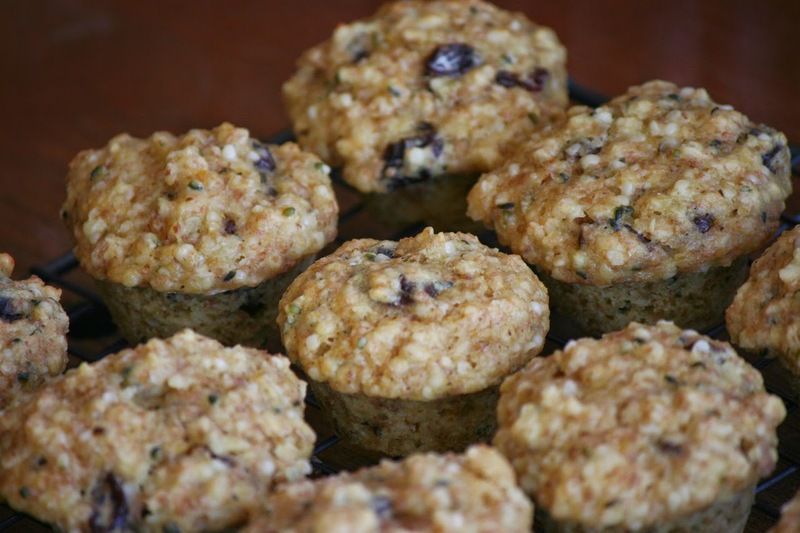 I make mini muffins every week for the kids to take on their lunches--the ones pictured here are a mix of wheat flour, quinoa flakes, and oat bran with 3/4 cup of raisins and 3/4 cup of hemp seeds for a real protein boost in the middle of the day. You can also add things such as lemon or orange zest, and a variety of spices to craft your own unique muffin creations. I find that the muffins will hold their shape if at least one cup of the dry ingredients is wheat flour (all purpose, or whole wheat pastry). I also find that soaking things like quinoa flakes and bran in the liquid for 5 mins or so keeps the final batter from being too wet. If your final batter is to wet or too dry you can always add more flour or liquid as necessary. - up to 1 1/2 cups of any combination of fruit, dried fruit, nuts, seeds, chocolate chips, etc. Preheat oven to 375 degrees. Lightly grease a muffin tin. 1. Whisk together flour(s), baking powder, salt, and sugar (and spices, if using) in a large bowl. Make a well in the centre and add your liquid, oil, and vanilla. Gently mix until flour is hydrated. Fold in fruit, nuts, or whatever your are using. 2. Divide batter evenly into the muffin tins. Bake for 18-20 mins. 3. Let muffins cool for about 5 mins, then remove from tins to a wire rack to fully cool.